I love my laundry. I love my wine. You wouldn’t think the two would overlap, but former hotel GM Clayton Howard and his business partner found a link. And in their opening month a roaring wine trade is being supplemented by a growing band of laundry customers. The concept is simple. By day they operate a small laundry for individual and businesses (washers and dryers below, a person ironing in the compact orange space above). 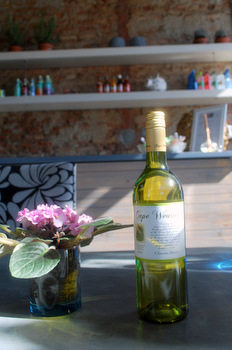 On offer is quality coffee, non-alcoholic beverages and snacks. By night the old brick building hosts intimate private functions where wine and a variety of talented chefs are part of the deal. Fourteen seats keep it intimate. Wine sales happen in between. The legendary New York French Laundry restaurant started in a similar way, so the natural question is whether a full-blown Cape restaurant is on the cards. It’s not. Howard and partner are focusing on wine orders. They’ve already moved 15000 bottles so something is working. They’ll never sell more than one white and one red wine from their 15 wine partners (these may change over time). The appeal? I love my wine takes a small commission, and wines are sold at cellar door prices, enabling lesser known “hand-sell” labels to become known, and occasionally unsold export orders find their way to local audiences. This explains why we arrived for an unplanned late lunch (45 minutes in and out) and left with a few bottles of Cape Weaver Chenin Blanc 2010. I’ve never seen this export label made by Eric Saayman, and really enjoyed the oily mouthfeel and rich baked quince character of old Swartland bushvines. It was served alongside our dim sum basket, and seemed like a steal at R28 per bottle. On to the food. I love my laundry is not licenced, so glasses of wine are served on the house, and options change often. The small daytime menu consists of breakfast scrambled egg and bacon, and all-day baskets of dim sum made by Beluga’s dim sum chef. Coffees, non-alcoholic beverages and a few other snacks are the only other options. Our dim sum choices were eight pieces of steamed pork, chicken or pepper wontons. For R40 the price included a “free” glass of wine. Sharing one portion of pork and one chicken between two made a light meal, but the pork in particular was spicily delicious enough to make us want to return. 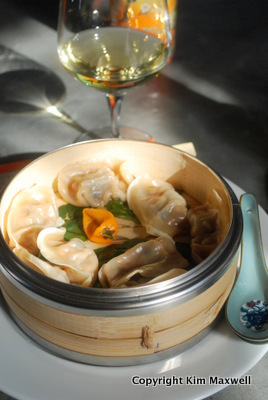 The wontons are steamed on spinach leaves instead of the usual paper, with bottled Asian sauces as condiments. Tip: Look out for laundry parties. On Wed 25 April I love my laundry is hosting a tasting of cupcakes from I like my pie, alongside Nitida sparkling Shiraz MCC. Women are welcome at no charge. 5.30pm – 6.30pm. 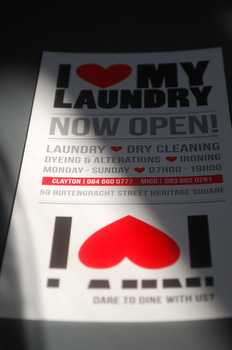 I LOVE MY LAUNDRY, 59 Buitengracht Heritage Square , Cape Town. I love my laundry, Tel 084 660 0777. Open daily from 7am – 7pm. Check about evening functions and themed wine tastings. One more thing. I think that there are quite a few travel insurance web pages of respectable companies than enable you to enter your vacation details and get you the quotations. You can also purchase this international travel cover policy on the web by using your own credit card. Everything you should do is to enter your travel information and you can begin to see the plans side-by-side. Only find the plan that suits your financial allowance and needs and after that use your bank credit card to buy it. Travel insurance online is a good way to search for a respectable company with regard to international travel cover. Thanks for revealing your ideas.